Yesterday we reported how Wikileaks has uncovered a global network of surveillance companies for hire. 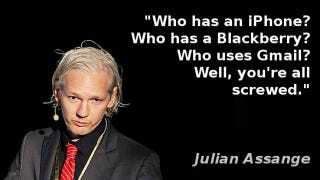 Now Assange is telling it like it is. Talking at a press conference, which you can watch here, he explained that "the reality is intelligence contractors are selling, right now, to countries across the world, mass surveilance systems for [iPhone, Blackberry and Gmail]."